A major landmark, the entry of eight men and eight women from DPR Korea for the forthcoming Seamaster 2018 ITTF World Tour Platinum Shinhan Korea Open is a first; the first time they have competed in the now well-established event since the tournament was first staged in Seoul in 2001. Now laying politics to rest, can their players make an impact in the tournament scheduled to start in Daejeon with a two qualification event on Tuesday 17th July, a competition in which they must all compete? Can they make a similar impact as to when their predecessors first appeared on the ITTF World Tour? If that is to be the situation then it is very much to Kim Song I, Women’s Singles bronze medallist at the Rio 2016 Olympic Games, that we turn our attention. Following the conclusion of the Qatar Open on Friday 23rd February 2001, the second tournament of the year on what was then known as the ITTF Pro Tour, Kim Hyon Hui led the Women’s Singles Standings; Kim Hyang Mi, who three years later was to be the silver medallist at the Athens 2004 Olympic Games, occupied the no.5 spot. Together Kim Hyon Hui and Kim Hyang Mi owned top spot on the Women’s Doubles listings. Earlier in the month from Tuesday 6th to Sunday 11th February, DRP Korea had made their first ever ITTF Pro Tour appearance. The Women’s Team competed in the English Open staged in Chatham; Kim Hyang Mi and Kim Hyon Hui both experienced Women’s Singles defeat at the hands of Japan’s Yoshie Takada, the former in the semi-final, the latter in the final. However, in the Women’s Doubles event, the two DPR Korea players combined to secure gold; in the final they beat Japan’s Yuka Nishii and Miyuki Nishii. 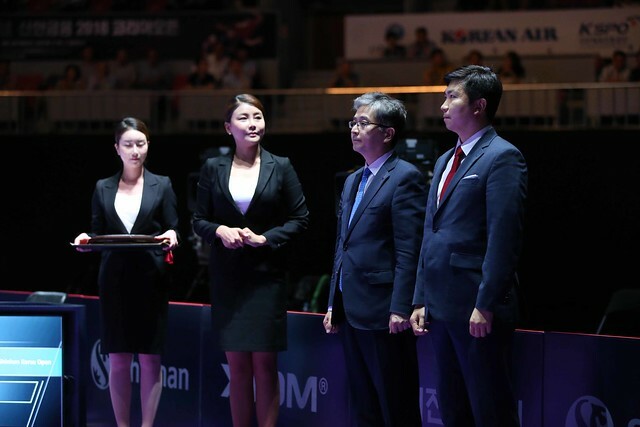 Later in the month in Qatar, Kim Hyon Mi won the Women’s Singles title beating Croatia’s Tamara Boros in the final; the win coming after having had to settle for runners up spot in the Women’s Doubles event when losing to Korea Republic’s Ryu Jihye and Kim Mookyo. Now in Daejeon the mantle of responsibility lies on the shoulders of a new generation; it is a hard act to follow but one fact would appear to remain the same; the thoughts of Ko Chol Ho who in 2001 in Chatham was the interpreter for the DPR Korean delegation. At the recent Liebherr 2018 World Team Championships, the wish of Ko Chol Ho was realised; now as in Chatham, there is another step forward in Daejeon. One wonders how big that step may eventually prove.